Performance Pack - Special Offer - for all the owners of the Volkswagen Amarok 2.0 Diesel 2012-2016 who want get the best performance without compromising the reliability of the vehicle. 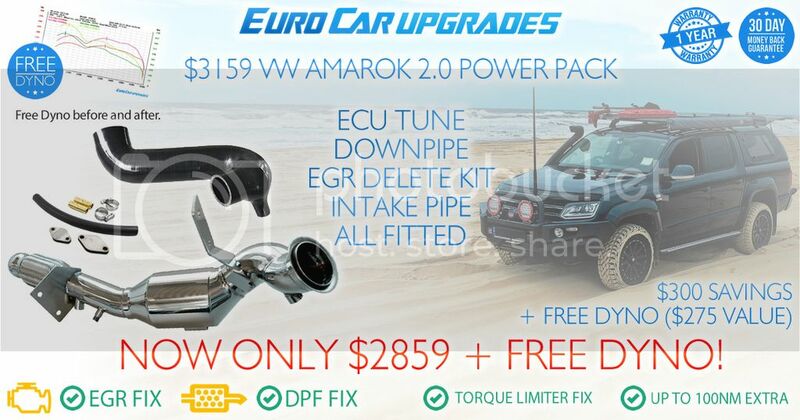 Unlimited time offer for the whole Pack only and only done in at Euro Car Upgrades in Maroochydore, Sunshine Coast, QLD. All fitted, tested, with free dyno chart - before and after the upgrade is completed. All these upgrades work well together, they change the car completely, eliminate the common EGR & DPF problems, and save you fuel. Everything with 12 months warranty & 30 days money back guarantee for the tune.